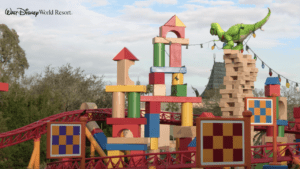 Today Bob Chapek, Chairman of Walt Disney Parks & Resorts gave fans a new look at Toy Story Land in Hollywood Studios and Shanghai Disneyland by showing them a new video and some new photos. 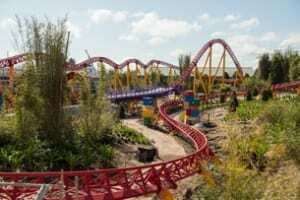 Yes there are two versions of Toy Story Land being built, both being quite different from each other. Let’s take a look at them. When Disney’s Hollywood Studios Toy Story Land opens up June 30th, it’s going to shrink down guests to the size of a toy and put them right in the middle of Andy’s backyard. Just like being in the films! Expect to see Woody, Jessie, Buzz and all the other Toy Story Characters. 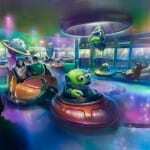 There are going to be 3 attractions as part of this new land, Toy Story Midway Mania, which is getting a brand new ride queue; the family friendly Slinky Dog Dash Coaster and Alien Swirling Saucers. In the photos you get a good idea for how Slinky Dogs Dash is going to be. One of the coolest parts is where all the blocks are stacks up and you see Rex on top getting lassoed by Jessie. Looks like a lot of fun! In Alien Swirling Saucers guests will climb into a toy rocket being pulled by alien flying saucers as they lead you on a galactic mission that’s out-of-this-world! Beware however that you don’t get chosen by “the claw.” If it looks familiar that’s because it’s very similar to Mater’s Junkyard Jamboree in Disney California Adventure. You can check out the Toy Story Land Height Requirements Disney has listed here. Disney was also kind enough to release the Toy Story Land Height Requirements this past week for all 3 of the land’s attractions. Bob Chapek also gave an awesome behind-the-scenes video that shows the progress that’s being made on Toy Story Land in Shanghai Disneyland. 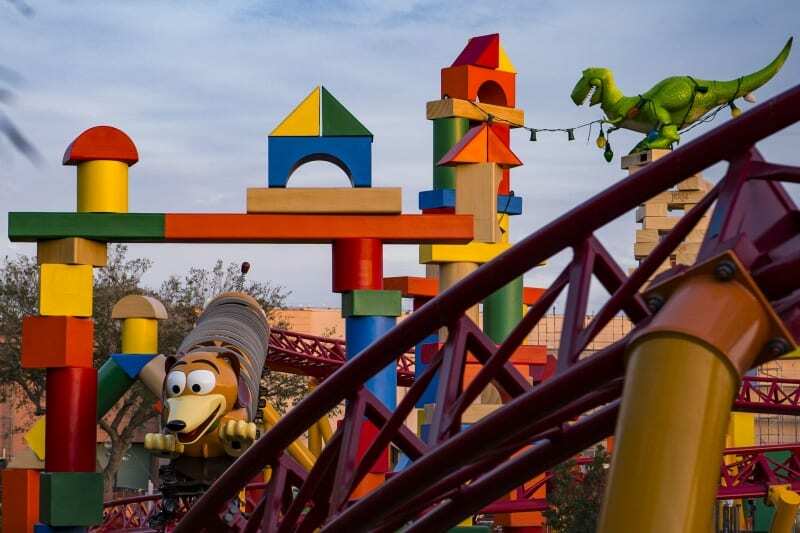 It will have 3 Attractions: Rex’s Racer, Slinky Dog Spin and Woody’s Round-Up – and will open up even before the Walt Disney World version on April 26, 2018. I’m looking forward to both of these new lands, don’t forget that Hollywood Studios has adjusted its opening and closing hours to accomodate more people that will be inevitably swarming to the park this Summer! See you there! 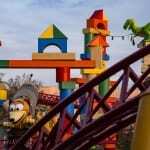 I want to know what you think about the new video and photos of Toy Story Land in Disney’s Hollywood Studios and Shanghai Disneyland. Are you visiting one of them this Summer? Which one are you looking forward to more? Let us know in the comments section below!